This studio in Reñaca offers panoramic ocean views from its hilltop location, plus access to shared amenities. You'll have everything you need for an unforgettable vacation! Its compact and welcoming environment makes this apartment perfect for a couple’s getaway. 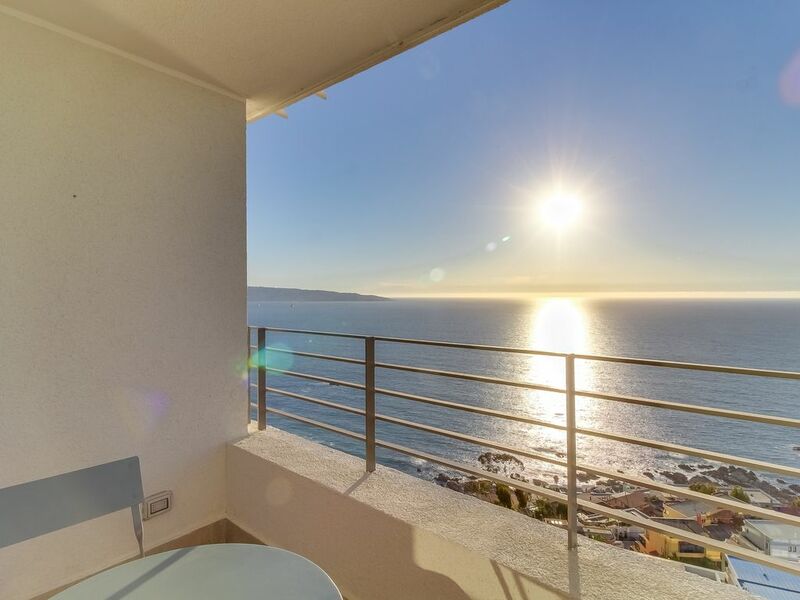 You will be able to enjoy the warm sunlight and the fresh sea breeze thanks to the large private balcony; however, the best feature is the incredible view of the ocean that you will have. The kitchen includes a small refrigerator and all the necessary appliances to prepare whatever you want to during your stay. If you wish, you can use the shared pool, located on the terrace. This rental is located on the north side of Reñaca, within easy walking distance of a grocery store and numerous shops to buy everything you may need. Walk down a couple of blocks to one of the fabulous beaches this town is known for. Reñaca has plenty of things to do, but you might also like to visit Viña del Mar to the south to do some shopping, see a movie at the cinema, or gamble at the casino. On the opposite direction, to the north, you will find the city of Concón, where you must visit the seafood restaurants and recognized empanadas establishments. Viña del Mar’s most visited area awaits you. Book now! Parking Notes: There is one reserved parking space for you on-site, #98.